The Elms were an American Christian rock band known for their breed of rootsy, blues-based rock, with the essence of the music of the 60's and 70's. Although the band had been in existence since 2000, 2001 saw the release of their first full-length album, with the first musical contribution from Thomas Daugherty on guitar. Thus, 2001 is widely considered The Elms' first fully functional year in existence. Some members reside in the southern Indiana city of Seymour, Indiana. The Elms have drawn stylistic comparisons to The Black Crowes, Tom Petty and the Heartbreakers, The Kinks, and The Beatles. 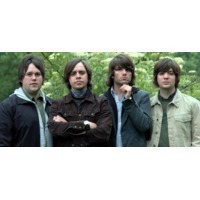 The Elms released their major-label debut album, The Chess Hotel, on May 2, 2006. The band's final album, The Great American Midrange, was released on September 15, 2009. It peaked at #18 on the Billboard Heatseekers chart and was The Elms' highest-charting album to date. The only officially released single from The Great American Midrange was the song "Back To Indiana," and the track's music video premiered online in November 2009. On June 1, 2010 the band announced via their web site that they would disband in July 2010.